With the emerging and ever evolving fashion trends one have to ace for the pace. It never seems to stop, every now and then new trend flashes in and takes everything in its fold. 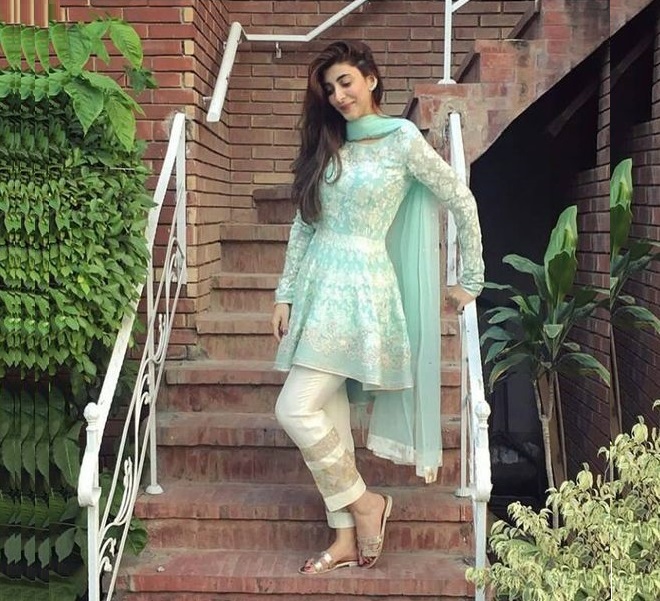 As of fashion in Pakistan, it is so rich and diverse in its form that you end up with number of ethnic flavor resting in your wardrobe. Just as the peplum trend has kicked in, it too has taken number of variant styles and patterns that you might not even be aware of. From the exquisite wedding wears to the casual wardrobe, peplum frocks these days are seen everywhere. If you couldn’t agree any less then you are here for all the right reasons. Diverse range of peplum styled frocks will surely stun you to the core. Well, to have some deeper insight regarding the outclass peplum frock styles let us share its various top notch latest launched versions which are available out in the market. Peplum Frocks 2017 Designs from the popular designer collections of the season are displayed right below. 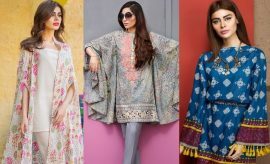 Starting from the casual short frocks to formal and fancy peplums paired with sharara pants, bell bottoms, tulip pants, pencil pants, trousers and straight pants, the collection covers a huge variety of designs and styles which are in trend these days. 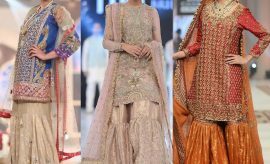 Heavily embroidered Peplums are also worn even with lehengas by brides.Short peplums with bell bottoms are most worn evening wears seen this season in the designer galleries. 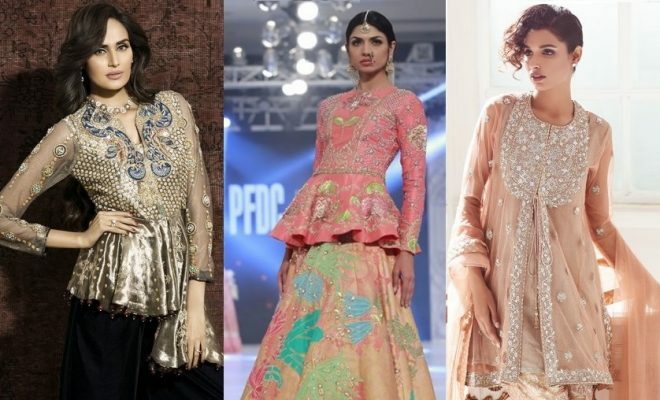 In fact the ever increasing trend of short frocks has forced designers and brands to bring different styles of casual peplums in their seasonal collections this summer. So are you ready to shine this season in the classy peplums making you look even more classy and fabulous? 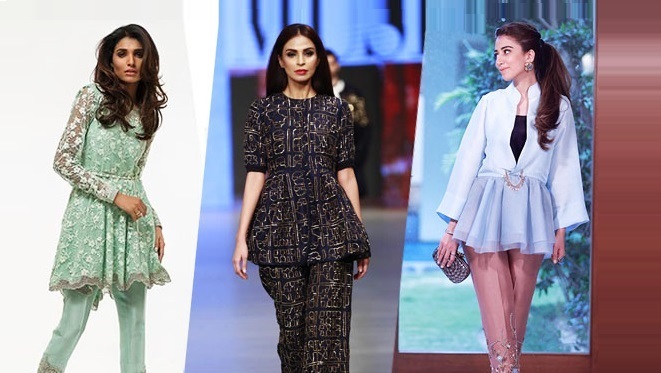 Start exploring this trendy collection and pick up the designs which seem appropriate to you. Flaunt the flares of your fabulous peplum top with the volumized Sharara pants. This is a mix which is gaining immense popularity, this might be due to the perfection of the two. These two go so perfectly together that you can’t help going crazy after it. 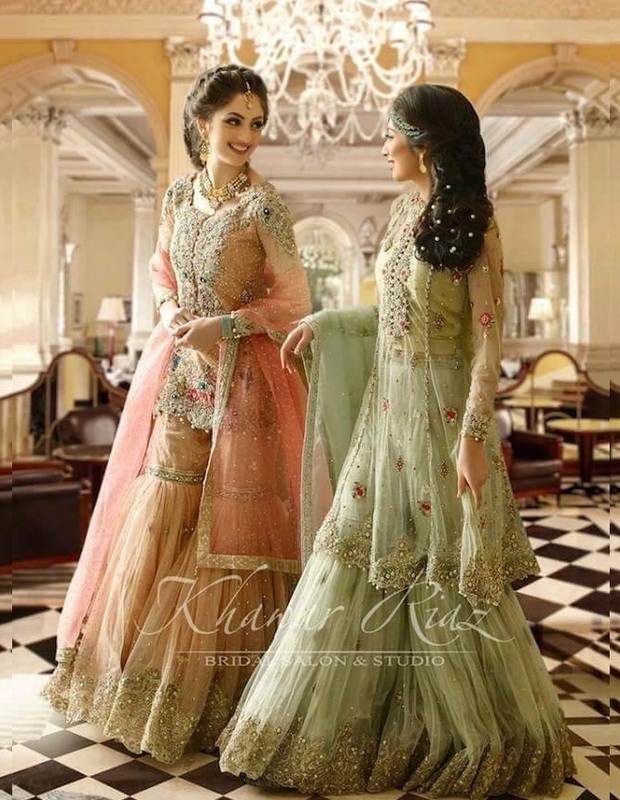 Moreover the series of wedding wears design in this particular style is ravishing. Heavy embroidery work over the peplum tops complements the heavy flares of the pants and fancy shimmers of the knee bands. Top in silk is made to keep it all firm and well in shape the bottom however is crafted in chiffon to create a nice fall. Soft pastel shades are much in trend for the peculiar style, giving it a gorgeous finish. If you are in love with traditional wears, then these classical peplum designs paired with shararas will simply look adorable. For those who love the soft tulip wrap around their ankles and buys for the smartness it brings, this style has definitely much to say to you. The delicate tulip bottom adds certain charm to the flared peplum and gives a fine outlook. 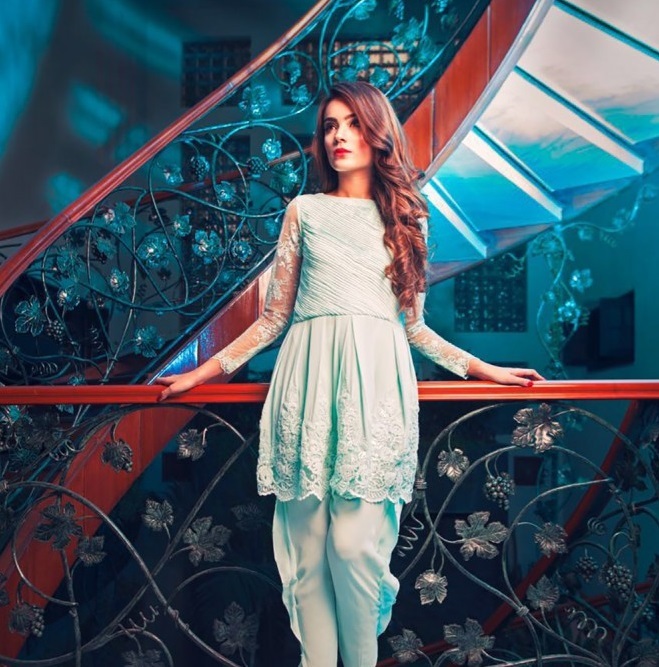 For fancier dresses, these pants are crafted with tousles or even with embroideries. Peplum frocks on the other hand are designed with varying type of its bodice with double layered flares and the light chiffon sleeves. Your bodice can be heavily embroidered but the lower peplum should be firm to keep its shape nice and gorgeous. Have a look at these classy peplums paired up with tulip pants and tulip salwars to wear a classical look this year. Bells to a peplum frock are like the perfect match; both have the seemingly sharp curves and spreads into a bell to a beautiful fall and flares. In this particular style peplum frocks are either printed or embroidered while trousers are plain and simple. Sometimes designers prefer to create a contrast of dazzling hues. Whereas love for soft shades is still in the air. Wherever you will see models adorned in pretty peplum frock with bell bottoms, you will find those all designed in silk as the fabric has more weight in it. Whereas the frocks are the mix of chiffon, net, cotton or even Georgette sometimes. As appealing the contrast may look, but the monochromatic hues are more common in this particular style. 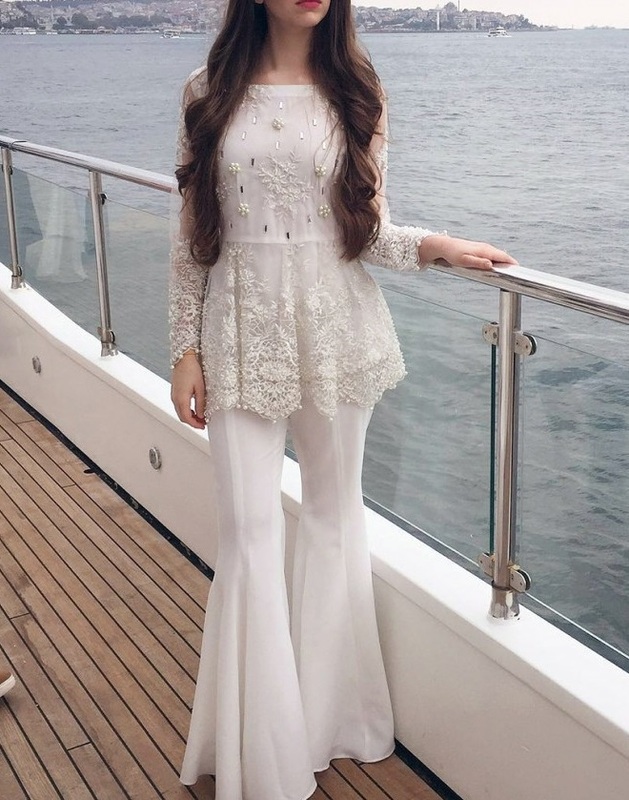 Bell Bottoms are quite in trend these days and give an extremely gorgeous and magical look to the tops paired with them. 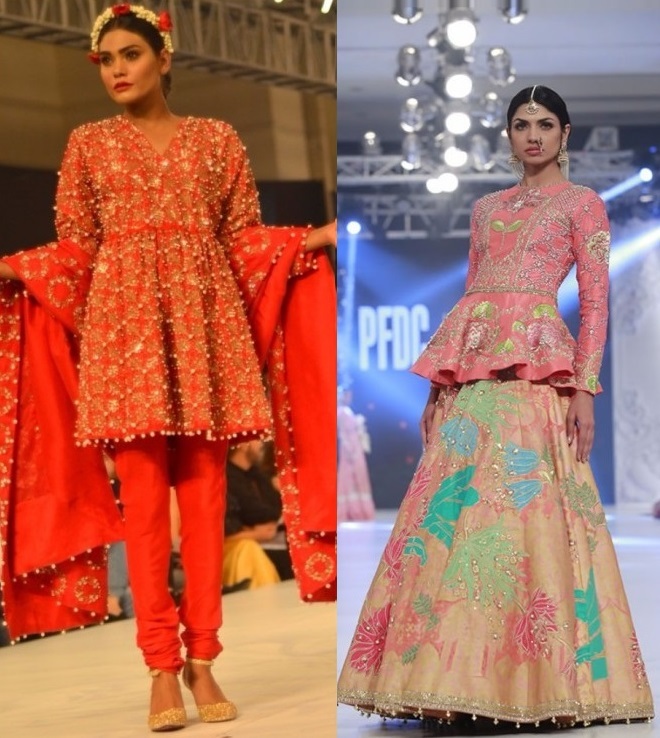 Traditional ethnic wearables should not be left behind while talking about any style, keeping the same idea in mind our designers has paired peplum frocks with traditional lehengas which is perfect option for any desi wedding. Such frocks are kept short and upto the waist while the lehengas are heavy and has much volume. Lehengas can also be replaced with the skirt bringing new to the old. Peplum frock also looks great with Churidar Pajamas hence one can also carry it with the same. 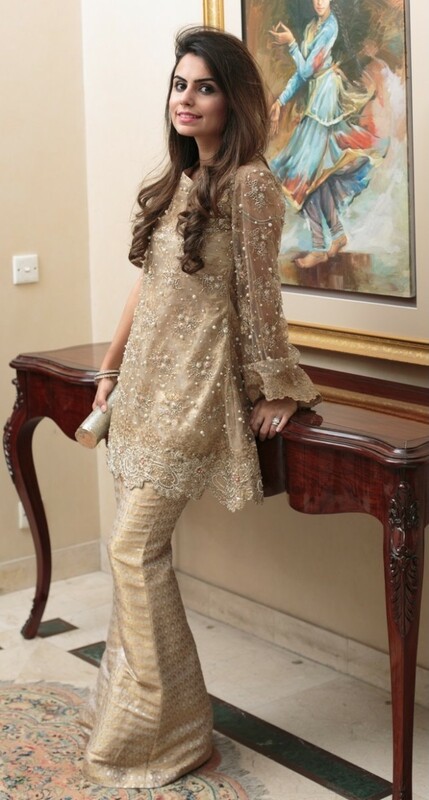 Try to keep it plain while the frock should be central to all the embroideries and embellishments. For your routine wardrobe you cannot carry heavy bottoms as this could create bit of discomfort for you. So you go for something much simpler yet trendy. A nice decent peplum frock in chiffon or net with a cigarette pant is one comfy option for you in this regard. You don’t have to work an extra miles on its designing, just get any peplum top and match with your favorite white and Voila, you are good to go. Are you going to get these trendy Peplum frocks for the upcoming parties and functions? Do share your views with us in the comment section below. We are looking forward to your positive feedback so we may bring . 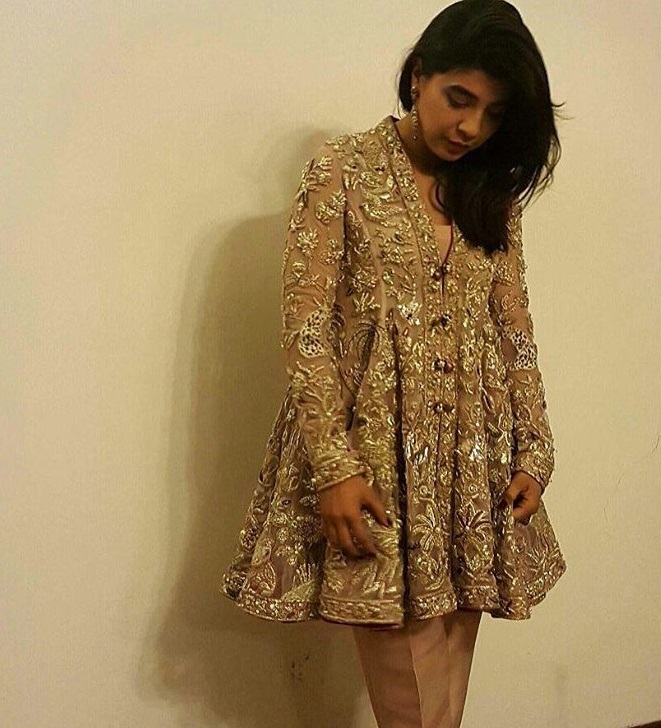 Stay tuned with StylesGlamour for more designer wear dresses and trend alerts.